Parallel execution enables the application of multiple CPU and I/O resources to the execution of a single SQL statement. Parallel execution dramatically reduces response time for data-intensive operations on large databases typically associated with a decision support system (DSS) and data warehouses. You can also implement parallel execution on an online transaction processing (OLTP) system for batch processing or schema maintenance operations, such as index creations. Parallel execution is sometimes called parallelism. Parallelism is the idea of breaking down a task so that, instead of one process doing all of the work in a query, many processes do part of the work at the same time. An example of this is when four processes combine to calculate the total sales for a year, each process handles one quarter of the year instead of a single process handling all four quarters by itself. The improvement in performance can be quite significant. Parallel execution is used to reduce the execution time of queries by exploiting the CPU and I/O capabilities in the hardware. The query references a large data set. Serial execution is different than parallel execution in that only one process executes a single database operation, such as a SQL query. The query references a small data set. Parallel execution is designed to effectively use multiple CPUs and disks to answer queries quickly. It is very I/O intensive by nature. To achieve optimal performance, each component in the hardware configuration must be sized to sustain the same level of throughput: from the CPUs and the Host Bus Adapters (HBAs) in the compute nodes, to the switches, and on into the I/O subsystem, including the storage controllers and the physical disks. If the system is an Oracle Real Application Clusters (Oracle RAC) system, then the interconnection also has to be sized appropriately. The weakest link is going to limit the performance and scalability of operations in a configuration. Parallel execution breaks down a task so that, instead of one process doing all of the work in a query, many processes do part of the work at the same time. Each SQL statement undergoes an optimization and parallelization process when it is parsed. The user session or shadow process takes on the role of a coordinator, often called the query coordinator (QC) or the parallel execution (PX) coordinator. The QC is the session that initiates the parallel SQL statement. The PX coordinator obtains the necessary number of processes called parallel execution (PX) servers. The PX servers are the individual processes that perform work in parallel on behalf of the initiating session. The SQL statement is executed as a sequence of operations, such as a full table scan or an ORDER BY clause. Each operation is performed in parallel if possible. When the PX servers are finished executing the statement, the PX coordinator performs any portion of the work that cannot be executed in parallel. For example, a parallel query with a SUM() operation requires adding the individual subtotals calculated by each PX server. Finally, the PX coordinator returns the results to the user. Parallel execution uses the producer/consumer model. A parallel execution plan is carried out as a series of producer/consumer operations. Parallel execution (PX) servers that produce data for subsequent operations are called producers, PX servers that require the output of other operations are called consumers. Each producer or consumer parallel operation is performed by a set of PX servers called PX server sets. The number of PX servers in PX server set is called Degree of Parallelism (DOP). The basic unit of work for a PX server set is called a data flow operation (DFO). Figure 8-1 illustrates the parallel execution of the example query. Description of "Figure 8-1 Inter-operation Parallelism and Dynamic Partitioning"
As illustrated in Figure 8-1, there are actually eight PX servers involved in the query even though the DOP is 4. This is because a producer and consumer operator can be performed at the same time (inter-operation parallelism). Also all of the PX servers involved in the scan operation send rows to the appropriate PX server performing the SORT operation. If a row scanned by a PX server contains a value for the last_name column between A and G, that row is sent to the first ORDER BY parallel execution server. When the scan operation is complete, the sorting processes can return the sorted results to the query coordinator, which returns the complete query results to the user. The basic unit of work in parallelism is a called a granule. Oracle Database divides the operation executed in parallel, such as a table scan or index creation, into granules. Parallel execution (PX) servers execute the operation one granule at a time. The number of granules and their sizes correlate with the degree of parallelism (DOP). The number of granules also affect how well the work is balanced across PX servers. Block range granules are the basic unit of most parallel operations, even on partitioned tables. From an Oracle Database perspective, the degree of parallelism is not related to the number of partitions. Block range granules are ranges of physical blocks from a table. Oracle Database computes the number and the size of the granules during run-time to optimize and balance the work distribution for all affected parallel execution (PX) servers. The number and size of granules are dependent upon the size of the object and the DOP. Block range granules do not depend on static preallocation of tables or indexes. During the computation of the granules, Oracle Database takes the DOP into account and tries to assign granules from different data files to each of the PX servers to avoid contention whenever possible. Additionally, Oracle Database considers the disk affinity of the granules on massive parallel processing (MPP) systems to take advantage of the physical proximity between PX servers and disks. When partition granules are used, a parallel execution (PX) server works on an entire partition or subpartition of a table or index. Because partition granules are statically determined by the structure of the table or index when a table or index is created, partition granules do not give you the flexibility in executing an operation in parallel that block granules do. The maximum allowable degree of parallelism (DOP) is the number of partitions. This might limit the utilization of the system and the load balancing across PX servers. When partition granules are used for parallel access to a table or index, you should use a relatively large number of partitions, ideally three times the DOP, so that Oracle Database can effectively balance work across the PX servers. A distribution method is the method by which data is sent (or redistributed) from one parallel execution (PX) server set to another. The following are the most commonly used distribution methods in parallel execution. The hash distribution method uses a hash function on one or more columns in the row which then determines the consumer where the producer should send the row. This distribution attempts to divide the work equally among consumers based on hash values. In the broadcast distribution method, each producer sends all rows to all consumers. This method is used when the result set of the left side in a join operation is small and the cost of broadcasting all rows is not high. The result set from the right side of the join does not need to be distributed in this case; consumer PX servers assigned to the join operation can scan the right side and perform the join. Range distribution is mostly used in parallel sort operations. In this method each producer sends rows that have a range of values to the same consumer. This is the method used in Figure 8-1. 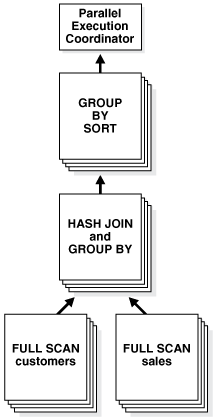 Hybrid hash is an adaptive distribution method used in join operations. The actual distribution method is decided at runtime by the optimizer depending on the size of the result set of the left side of the join. The number of rows returned from the left side is counted and checked against a threshold value. When the number of rows is less than or equal to the threshold value, broadcast distribution is used for the left side of the join, and the right side is not distributed as the same consumer PX servers assigned to the join operation scan the right side and perform the join. When the number of rows returned from the left side is higher than the threshold value, hash distribution is used for both sides of the join. To determine the distribution method, the parallel execution (PX) coordinator examines each operation in a SQL statement's execution plan and then determines the way in which the rows operated on by the operation must be redistributed among the PX servers. As an example of parallel query, consider the query in Example 8-1. Figure 8-2 illustrates the data flow or query plan for the query in Example 8-1, and Example 8-2 shows the explain plan output for the same query. The query plan shows that an adaptive distribution methods was picked by the PX coordinator. Assuming the optimizer picks hash distribution at runtime, the execution proceeds as follows: two sets of PX servers, SS1 and SS2, are allocated for the query, each server set has four PX servers because of the PARALLEL hint that specifies the DOP of the statement. PX set SS1 first scans the table customers and sends rows to SS2, which builds a hash table on the rows. In other words, the consumers in SS2 and the producers in SS1 work concurrently: one in scanning customers in parallel, the other is consuming rows and building the hash table to enable the hash join in parallel. This is an example of inter-operation parallelism. After a PX server process in SS1 scans a row from the customers table, which PX server process in SS2 should it send it to? In this case, the redistribution of rows flowing up from SS1 performing the parallel scan of customers into SS2 performing the parallel hash-join is done by hash distribution on the join column. That is, a PX server process scanning customers computes a hash function on the value of the column customers.cust_id to decide which PX server process in SS2 to send it to. The redistribution method used is explicitly shown in the Distrib column in the EXPLAIN PLAN of the query. In Figure 8-2, this can be seen on lines 5, 9, and 14 of the EXPLAIN PLAN. After SS1 has finished scanning the entire customers table, it scans the sales table in parallel. It sends its rows to PX servers in SS2, which then perform the probes to finish the hash join in parallel. These PX servers also perform a GROUP BY operation after the join. After SS1 has scanned the sales table in parallel and sent the rows to SS2, it switches to performing the final group by operation in parallel. At this point the PX servers in SS2 send their rows using hash distribution to PX servers on SS1 for the group by operation. This is how two server sets run concurrently to achieve inter-operation parallelism across various operators in the query tree. Description of "Figure 8-2 Data Flow Diagram for Joining Tables"
To execute a query in parallel, Oracle Database generally creates a set of producer parallel execution servers and a set of consumer parallel execution servers. The producer server retrieves rows from tables and the consumer server performs operations such as join, sort, DML, and DDL on these rows. Each server in the producer set has a connection to each server in the consumer set. The number of virtual connections between parallel execution servers increases as the square of the degree of parallelism. When an instance starts, Oracle Database creates a pool of parallel execution servers, which are available for any parallel operation. The initialization parameter PARALLEL_MIN_SERVERS specifies the number of parallel execution servers that Oracle Database creates at instance startup. Oracle Database can process a parallel operation with fewer than the requested number of processes. If all parallel execution servers in the pool are occupied and the maximum number of parallel execution servers has been started, the parallel execution coordinator switches to serial processing. To optimize performance, all parallel execution servers should have equal workloads. For SQL statements run in parallel by block range or by parallel execution servers, the workload is dynamically divided among the parallel execution servers. This minimizes workload skewing, which occurs when some parallel execution servers perform significantly more work than the other processes. For the relatively few SQL statements executed in parallel by partitions, if the workload is evenly distributed among the partitions, you can optimize performance by matching the number of parallel execution servers to the number of partitions or by choosing a DOP in which the number of partitions is a multiple of the number of processes. This applies to partition-wise joins and parallel DML on tables created before Oracle9i. Refer to Limitation on the Degree of Parallelism for more information. Each parallel execution (PX) coordinator in an execution plan is called a parallelizer. The number of PX servers used by a SQL statement is determined by the statement degree of parallelism (DOP) and the number of parallelizers. Because the number of PX server sets for a parallelizer is limited to two, the number of PX servers for most statements is DOP*2. Some statements can have more than one parallelizer. Because each parallelizer can use two PX server sets, the number of PX servers for these statements can be more than DOP*2. You can identify these statements by looking at the EXPLAIN PLAN. If the plan has multiple PX coordinators it means the statement has multiple parallelizers. A few example cases where SQL statements use multiple parallelizers are subquery factoring, grouping sets, star queries, in-memory aggregation, and noncorrelated subqueries. Multiple parallelizers in a SQL statement can be active concurrently or one after the other depending on the execution plan. A statement with a single parallelizer allocates the required number of PX servers at the start of execution and holds these allocated PX servers without releasing until the statement completes. This ensures that the number of PX servers throughout the execution is constant. Statements with multiple parallelizers are different as they allocate PX servers when each parallelizer starts. Because parallelizers can start at different times during the execution, each parallelizer may be running with a different number of PX servers based on the number of available processes in the system. If multiple parallelizers are executed concurrently the statement can use more PX servers than DOP*2. The view V$PQ_SESSTAT shows the number of parallelizers in the STATISTIC column. The data flow operation statistic,DFO Trees , shows the number of parallelizers. The Server Threads statistic shows the maximum number of PX servers used concurrently for a SQL statement. By default in an Oracle RAC environment, a SQL statement executed in parallel can run across all the nodes in the cluster. For this cross-node or inter-node parallel execution to perform, the interconnect in the Oracle RAC environment must be sized appropriately because inter-node parallel execution may result in heavy interconnect traffic. Inter-node parallel execution does not scale with an undersized interconnect. In an Oracle RAC environment, you can use services to limit the number of instances that participate in the execution of a parallel SQL statement. The default service includes all available instances. You can create any number of services, each consisting of one or more instances. When a user connects to the database using a service, only PX servers on the instances that are members of the service can participate in the execution of a parallel statement. To limit parallel execution to a single node, you can set the PARALLEL_FORCE_LOCAL initialization parameter to TRUE. In this case, only PX servers on the instance that a session connects to is used to execute parallel statements from that session. Note that when this parameter is set to TRUE, all parallel statements running on that instance are executed locally, whether the session connects to the instance directly or connects using a service. Parallel statements executed on flex clusters can use both hub and leaf nodes. As user sessions are only allowed to connect to the hub nodes, the coordinator process (Query Coordinator or PX Coordinator) resides on hub nodes and can use PX server processes from any node in the cluster. For parallel queries any PX server on any node can participate in the execution of the statement. For parallel DML operations only PX servers on hub nodes can participate in the execution of the DML part of the statement as only hub nodes are allowed to perform DML operations. When there is data distribution from the leaf nodes to the hub nodes for DML operations, the execution plan indicates this distribution. In the following example, data is distributed to hub nodes in line Id 5, indicating the load operation in line Id 3 is executed only on hub nodes.